It would be nice if our knitting projects could be done just as soon as we bind off, but even the simplest knitting pattern has at least two ends that need to be woven in (the only exception we've ever knit was the horizontal scarf, where the ends are used as fringe). 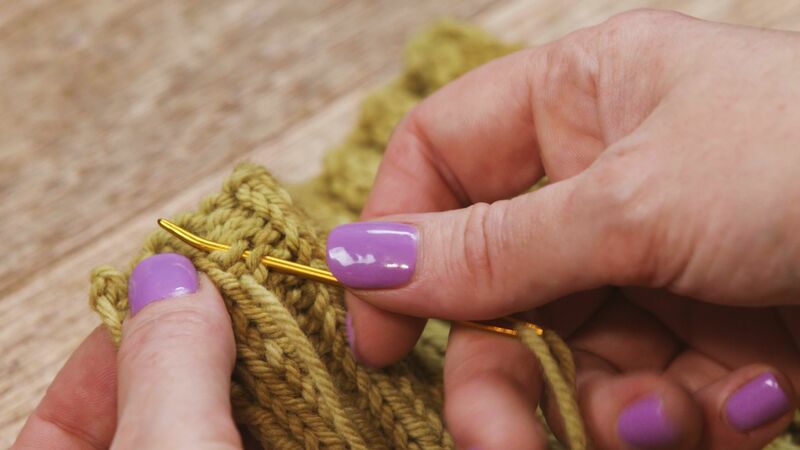 Weaving in ends, blocking and adding embellishments are just a few of the things you might need or want to do before a knitting project goes from "done" to truly "finished." Almost no matter what kind of project you're knitting, you'll have to weave in at least two ends before your project can really be called finished. There are a lot of different techniques for weaving in ends: some people like to weave into edges, some people follow the knit stitches as if they were making a duplicate stitch, still, others work in one direction, then another to help lock the ends into the project. Over time you'll find the way you most like to weave in your ends and which method is most successful for hiding those pesky strands as you wear or use your project. Blocking knitting is not always necessary and it's a step we skip fairly often. It is important to block projects like garments, as it can help make other finishing tasks easier, and it's essential when it comes to lace knitting. Blocking can help smooth out rough edges (it does not, however, eliminate Stockinette curl, make your knitting look a little more even and help with minor sizing issues. It's not a cure-all, and blocking too severely can lead to a garment that looks overworked and stressed, so use a light hand if you're blocking at all. If you're working on a garment, a pieced afghan or anything else with seams, the next step of finishing is to sew those seams. There are a lot of different ways you can go about seaming knitting (and different techniques are needed for different seams, such as a horizontal seam), but the most common way to seam basic Stockinette Stitch pieces is with what's known as a mattress stitch. Now is probably the time in your project when you'll want to contemplate sewing on buttons, adding zippers, lining your project or any other necessary details to make your project look finished. You may want to crochet around the edges of a project to give it a more finished look or add embroidery or ​another embellishment. You can also add things like tassels or fringe and pom poms at this point. Once you've done all the hard work of knitting and properly finishing your knitting project, make sure you take good care of it so you'll get years of use and enjoyment out of it. Remember that different fibers need to be treated in different ways, and it's always best to air on the side of a gentler treatment with handknits (or with items where you're unsure of the fiber content). It is generally a good idea, even with items that are machine washable, to dry knits flat rather than in the machine. You may also need to slightly reshape your knit items after washing, which is simple enough to do while they are still wet.